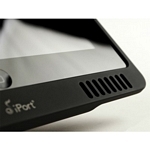 A selection of on-wall iPad docks from iPort. The LaunchPort is a revolutionary wallmount and desktop mount for the iPad and iPad Mini. A selection of iPad and iPad 2 in wall docks.